With her newfound resolve challenged, Becca decides that she and Matt must not be destined for each other after all. She accepts that she will have to forge a life alone—until a wrenching crisis and life-changing revelations teach her that true faith lies in all things, especially impossible second chances. I’m thank for you, the reader, for being interested in my book! I’d love to hear from you. Join my newsletter. Like my facebook author page, or send me an email. 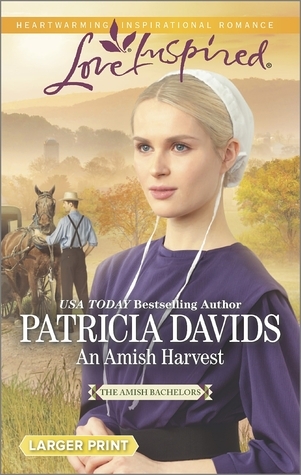 I enjoyed this very different Amish story, the people and their values are the same, but their lives have taken a very different turn. We meet sisters who have left the Amish faith, but not their beliefs in God, one because she married and left and the other who was left at the altar. I can just imagine the shock of being out in the world and how it must have hit Becca Yost, this is 1899 in Ohio, and she has just left her sheltered Amish life. We are about to watch her bloom, in more than one way. When romance comes to her in the form of the local doctor, we meet snobbery head on. His parents do not like her, and his mother does all she can to get rid of her, she has done it before. While I enjoyed the story, at times I found it a bit predictable, and rushed. That being said it is a fun read, and fast at that, one evening. I received this book through Kensington Books and was not required to give a positive review. Stick in the Mud Meets Spontaneity (Meet Your Match #3) by Rachael Anderson Home from college for the summer, Samantha Kinsey steps into her role as nanny for her two favorite little charges. But when she finds herself playing chauffeur more than playmate, her summer outlook quickly turns from fun to bleak. That is, until she drives the girls to a family-owned ranch and meets Colten McCoy—a genuine, hard-working cowboy, who's as set in his ways as he is handsome. Although he claims he doesn't need any fun in his life, Sam’s determined to help him find it. But she'll soon discover that cowboys are about as easy to train as wild mustangs. Stick in the Mud Meets Spontaneity is about an adaptable girl and a not so adaptable guy. It’s about learning to accept people for who they are and realizing that sometimes who they are is exactly who they should be. 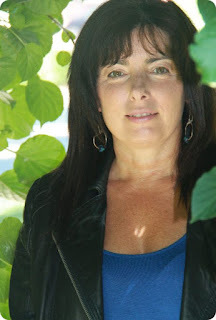 Author Rachael Anderson USA Today bestselling author, Rachael Anderson is the mother of four and is pretty good at breaking up fights, or at least sending guilty parties to their rooms. She can't sing, doesn't dance, and despises tragedies. But she recently figured out how yeast works and can now make homemade bread, which she is really good at eating. $50 Book Blast Giveaway Enter to win an Amazon Gift Card or Paypal Cash Ends 7/22/15 Open only to those who can legally enter, receive and use an Amazon.com Gift Code or Paypal Cash. Winning Entry will be verified prior to prize being awarded. No purchase necessary. You must be 18 or older to enter or have your parent enter for you. The winner will be chosen by rafflecopter and announced here as well as emailed and will have 48 hours to respond or a new winner will be chosen. This giveaway is in no way associated with Facebook, Twitter, Rafflecopter or any other entity unless otherwise specified. The number of eligible entries received determines the odds of winning. Giveaway was organized by Kathy from I Am A Reader and sponsored by the author. VOID WHERE PROHIBITED BY LAW. When Emmie Croftner answered the door to her late husband's home, she discovered a terrible truth. A woman she's never met reveals that she and Emmie shared the same husband and that the bigamist had never divorced his first wife. The home and farm are not Emmie's property after all. Suddenly displaced and powerless, Emmie realizes she can't stay in Wabash, Indiana, any longer. 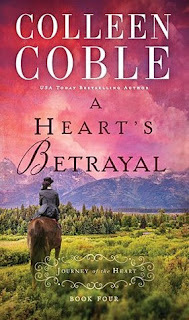 She makes for Fort Laramie, Wyoming, where her friend Sarah Montgomery and a new beginning await her. But when she arrives, she discovers she's carrying a child, conceived before her husband's death. Was the new start she'd hoped for only a mirage? 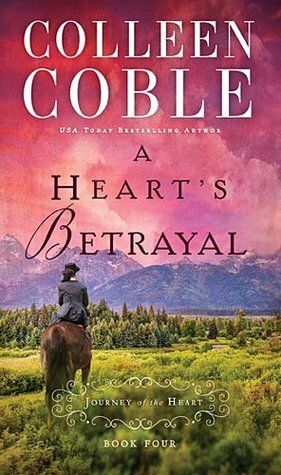 At Fort Laramie, a soldier named Isaac Liddle begins to court Emmie, prompting her to wonder whether she could ever really be his--and whether she dares to tell him she is carrying another man's baby. Find out more about Colleen at http://www.colleencoble.com/. Emmie Croftner has had a very hard life, and just when she finds true happiness, the rug is literally pulled out from under her. If you have been following the previous books in this series, Emmie’s last name should ring a bell for you, she is Ben’s sister. How could anyone forget the evil of Ben Croftner, and Emmie grew up in the same home, but she is nothing like Ben! As you can tell but the back of this book, poor Emmie has been duped into a marriage, that for her must have been an answer to her prayers. They were answered in a strange way, but who are we to question what God has planned for her. She has traveled to Fort Laramie, and is now embraced but her old friends, who love and want her companionship. No, the story does not finish with this book, and now I am waiting, patiently, not, for the next book in this series. I received this book through Litfuse Publicity Book tours and was not required to give a positive review. Rob Elliott's Laugh-Out-Loud joke books have brought laughter to more than half a million households. His last book invited kids into the action as he teamed up with cartoonist Jonny Hawkins to create "Laugh-Out-Loud Doodles for Kids." 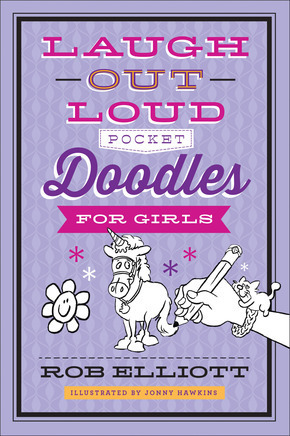 Now the dynamic duo is back with two brand-new books for boys and girls who love to draw and love to laugh! 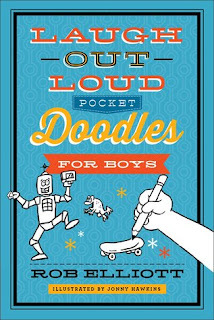 Packed with jokes that will keep boys and girls giggling for hours, and unfinished doodles for them to complete any way they want, these books keep little hands and minds busy. 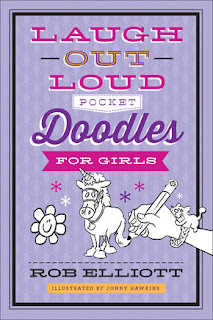 Perfect for road trips, lazy summer days, or anytime the kids say, "I'm bored!" Rob Elliott is the author of Laugh-Out-Loud Jokes for Kids, Laugh-Out-Loud Animal Jokes for Kids, and Knock-Knock Jokes for Kids, and has been a publishing professional for more than fifteen years. Rob lives in West Michigan, where in his spare time he enjoys laughing out loud with his wife and five children. When our eight year old opened this book for the first time, I was delighted with the Humor Code in the very front. We all agreed. From the moment I handed this to our eight year old, he couldn’t wait to turn the pages and share each page with us. He had to stop and do each of the drawings, and seemed to love what he was doing. He wouldn’t go on until he had completed what was required. Loved the tongue twisters, we were laughing out loud. This book would make a wonderful gift; it is appropriate for so many wonderful times. I will be buying more! I received this book through Revell Reads Book Blogger Tour, and was not required to give a positive review. The Sheik's Ruby by Whitney Award Winning Author Jennifer Moore Shelby wants to break away from the mold of her small town and make a name for herself in the big-city journalism world. While skiing, she meets mysterious stranger Hakim who is actually the prince of the Middle Eastern kingdom of Khali-dar. When his enemies learn of Hakim’s connection to an American girl, they target Shelby. Fleeing to the safety of Khali-dar, Shelby falls deeper in love not only with the prince, but with his country. As she struggles to survive terrorist attacks, withstand the Sheik’s prejudice, and find her place in a world she doesn’t understand, she must choose which life she is willing to sacrifice—the comfortable one she has worked so hard to create, or the one with the man she loves. Blog Tour Giveaway $25 Amazon Gift Card or Paypal Cash Ends 7/17/15 Open only to those who can legally enter, receive and use an Amazon.com Gift Code or Paypal Cash. Winning Entry will be verified prior to prize being awarded. No purchase necessary. You must be 18 or older to enter or have your parent enter for you. The winner will be chosen by rafflecopter and announced here as well as emailed and will have 48 hours to respond or a new winner will be chosen. This giveaway is in no way associated with Facebook, Twitter, Rafflecopter or any other entity unless otherwise specified. The number of eligible entries received determines the odds of winning. Giveaway was organized by Kathy from I Am A Reader and sponsored by the author. VOID WHERE PROHIBITED BY LAW. Life is already bad enough after Tisha Adams loses both her job and her beautiful Manhattan apartment. Living in a musty garage apartment and working for her uncle in Queens, her life is upended when she witnesses a murder on her train commute. When the body disappears, she teams up with Detective Murphy, a man with mysterious abilities. But Tisha is keeping a secret of her own, a skill she’s always hated and feared. The dead speak to her. And if she touches a person, their past, present and future are revealed to her. But as the body count rises, and those closest to Tisha are drawn into the nightmare, Tisha’s only choice is to reach out to her estranged grandmother to learn more about her intuitive talents. In a race against the clock to rescue those in danger and solve the murders, she’ll need all her abilities. Even the gift she’s been afraid to use. The dead will speak, but only if she’s willing to listen. 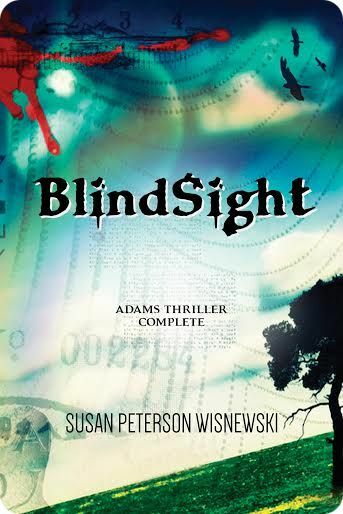 BlindSight is available at Amazon. 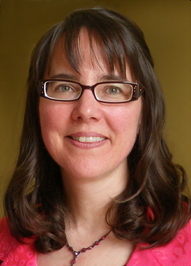 Susan Peterson Wisnewski is an indie author from the northeast. 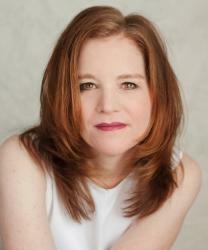 She writes thrillers and paranormal with a sprinkling of chick lit and horror. From a cruncher of numbers to a stringer of words, she decided it was time to follow her dreams and put down on paper all of those stories that floated around in her head. Raised in New York City and Long Island, she is a consummate shopaholic having been given the gift of style from her mother and grandmother. When not writing, she can be found shopping, visiting museums, gardening, or being walked by her oversized puppy. Her books are a genre mix all neatly packaged together. 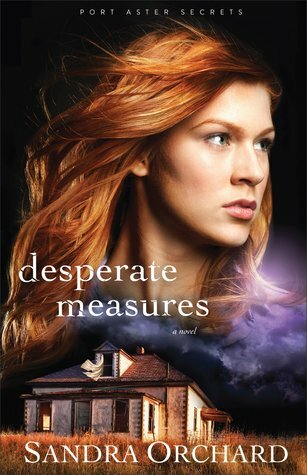 Surprise and twists keep her readers guessing and she has been accused of writing books that can’t be put down. Pushing characters to challenges themselves is her trademark as is a creating strong female characters – no damsels in distress here. Her inspiration comes from seeing a situation and then enhancing it to create an unusual story line. And yes, she does see ghosts, or spirits as they prefer to be called and has had her run ins with a fairy or two. If you have a book club and live on Long Island or in the Southern Vermont area, she’d be happy to come for a visit. Her latest book is the thriller/paranormal/suspense, BlindSight. Visit Susan Peterson Wisnewski’s website. Connect with Susan on Facebook and Twitter. Find out more about Susan at Goodreads. 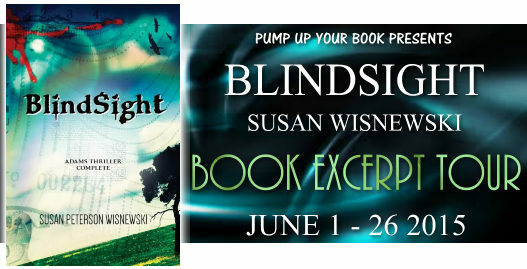 More books by Susan Peterson Wisnewski. I had never felt so alone. It was one thing to be living by myself, but here I was lying in bed afraid to get up, afraid the darkness wasn’t just a power outage with a new moon hampering any possible ray of light. The realization hit me hard. I was evil. The gift, as my absent mother called it, had come to take me and would lead me into the hell fire world that she had chosen over me. I couldn’t let it take me. The darkness had to end. I needed to find the light. I brought this book along on a road trip and it did not disappoint. Our 8 year old embraced it as quickly as I handed it to her. Not only will they be telling you the jokes, there is a lot of drawing an coloring involved to keep them busy. What a great find this book was, and such a great way to keep you kids reading and sharing. What an enjoyable time we all shared. I received this book through Revell Reads Blogger Program and was not required to give a positive review. An Amazing Group of Authors & Bloggers have joined with me to bring you 1 fabulous prize!!! We’re giving away $250 in Paypal Cash to help you do something you have been dreaming of this summer. Giveaway Details $250 Paypal Cash Ends 7/15/15 Open only to those who can legally enter, receive and use money sent via Paypal. Winning Entry will be verified prior to prize being awarded. No purchase necessary. You must be 18 or older to enter or have your parent enter for you. The winner will be chosen by rafflecopter and announced here as well as emailed and will have 48 hours to respond or a new winner will be chosen. This giveaway is in no way associated with Facebook, Twitter, Rafflecopter or any other entity unless otherwise specified. The number of eligible entries received determines the odds of winning. Giveaway was organized by Kathy from I Am A Reader and sponsored by the author, bloggers and publishers on the sponsor list. VOID WHERE PROHIBITED BY LAW. Ryan Chambers is a Civil War veteran still haunted by the horrors of battle. He’s been given the post as lighthouse keeper, and the isolation where he can drown in drink and hide from his past is appealing. He’s not expecting the current keeper to be a feisty and beautiful woman who’s none-too-pleased to be giving up her position. They both quickly realize he’s in no shape to run the lighthouse, but Ryan’s unwilling to let anyone close, ravaged by memories and guilt. Caroline’s drawn to this wounded soul, but with both of them relying on that single position, can they look past their loss to a future filled with hope…and possibly love? Celebrate the release of Hearts Made Whole by entering to win an Afternoon at the Beach prize pack and RSVPing to Jody’s June 23rd author chat party! Enter today by clicking the icon below. But hurry, the giveaway ends on June 23rd.Winner will be announced June 23rd at Jody’s Facebook party. RSVP here! A glimpse into our world just after the end of the Civil War, and how evil can be personified and how it was done was surprising. Carolyn Taylor’s lot in life has been a tough one, she has lost her mother, and as the book opens she looses her father. Now she is the support for her family, including a very ill younger sister. We next meet Ryan Taylor, a man fighting his own demons, today know as PTSD, and a sever injury. When he arrives on the scene he is about to disrupt her life like nothing else. The book is very informational, we lean quite a lot about what when into keeping the Lighthouse lite back in the 1800’s. Not an easy task, it took a lot of stamina, one that most believed a woman could not handle. This is one action packed book from the first to the last page, you never know what is going to happen, and that is a good thing. I for one never saw or even guessed what was about to take place. Loved the faith these people showed, and how they love God, sure helped in hopeless times. I really enjoyed this book! I received this book through Litfuse Virtual Book Tours and was not required to give a positive review. When Dr. Mark Baker and Nurse Kelly Atkinson are held at the mercy of a dangerous gunman, the lives of every emergency room patient are at stake. At the end of the evening three men are dead. One of them is a police officer who couldn't be saved despite Mark's best efforts. The other two are members of the feared Zeta drug cartel. Though the standoff is over, the killing is not, because when the drug cartel loses its members, revenge is not far behind. Facing an adversary whose desires are dark and efforts are ruthless, Mark finds himself under suspicion as a killer, yet still a potential victim. When he turns to his high school sweetheart, attorney Gwen Woodruff, for help, Kelly helplessly looks on, as she hides her own feelings for the good doctor. At the height of the conflict, three questions remain: Who is the shooter? Who will the next victim be? And can Mark prove his innocence before the gun turns on him? Enter today by clicking the icon below. But hurry, the giveaway ends on June 20th. The winner will be announced June 22nd on Richard’s blog. A retired physician, Dr. Richard Mabry is the author of seven critically acclaimed novels of medical suspense. His previous works have been finalists for the Carol Award and Romantic Times Reader’s Choice Award, and have won the Selah Award. He is a past Vice-President of American Christian Fiction Writers and a member of the International Thriller Writers. He and his wife live in North Texas. 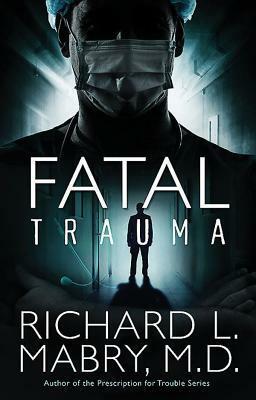 Learn more and purchase a copy at Richard’s website. Fatal Trauma had my heart in my throat from the first page forward, and made me keep turning the page, and I was not disappointed. We have a you ER doctor and nurse busy working and taking care of patients, when a gunman arrives with a man in a wheelchair having been shot, the man pushing the chair has a gun to the head of the nurse, and threatens everyone on the room. Oh my, this is just a taste of what you are about to experience as you enter the world and mind of Dr. Mabry. The twists and violence didn’t make sense to me, but when drugs are involved nothing makes is too much and of course there is a lot of money involved. This is not just one sweet romantic book, no, but it does have some romance, you just won’t be sure who is involved for a while. I never saw a lot of what happened coming, and some that I thought were the criminals turned out to be one of the good guys, and others, oh my they sure fooled me. Who can be trusted, just one and that is God, and yes there is a Christian focus in this book, and made my enjoyment of this book even greater. 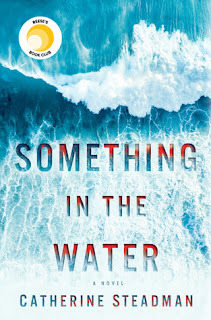 If you love suspense as I do, this is going to be a favorite book for you, a real page-turner, and don’t let your guard down, you will be waiting for the other shoe to drop. I received this book through Litfuse Publicity Blog Tours, and was not required to give a positive review. When Amish carpenter Samuel Bowman is injured in an accident, he fears he'll never see again. He's always provided for his family—and now that it's harvest season, the Bowmans are needed in the fields, not at his bedside. 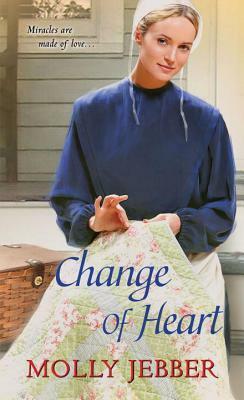 So when a young Amish widow becomes his nurse, Samuel expects Rebecca Miller to make his life easier. But his caregiver is bossy, outspoken and challenges him to move on with his life. Though Samuel's sight is in question, he can plainly see the woman he's come to care for won't let herself love again. Now it's Samuel's turn to heal her heart. I didn’t want this book to end, what a delightful read, the banter that goes on between Samuel and Rebecca is so funny. Yes there are serious moments here and we weather them along with some joy. Rebecca has lost her husband; the love of her life, and her brother-in-law appears to be courting her as the book opens. Then there is a serious injury, and that ends up being Samuel. He feels he is entirely responsible for their families furniture business, and when he is injured he takes the blame for everything. As you can guess, Rebecca is called to help by Samuel’s Dad; she took care of her husband when he was ill. Now opens the door to maybe a new life in Amish nursing, moving away and learning, or a bit of romance? It appears that one of Samuel’s brothers may be interested? Can Samuel accept his disabilities, and will the family business be able to continue. Ms. David’s has written a really compelling read, and it was so very enjoyable, I for one cannot wait for the next book in this series. 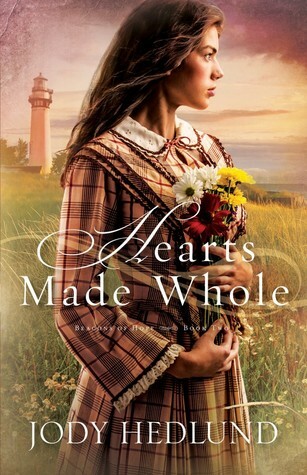 I received this book from the Publisher Harlequin through Net Galley, and was not required to give a positive review. Researcher Kate Adams has finally pinpointed the medicinal plant responsible for tearing her family apart. She's certain that discovering its secrets is her only hope of solving the mystery surrounding the disappearance of her father. Kate will risk anything to find the truth--even her budding relationship with Detective Tom Parker. But more people than she can fathom are after the plants and going it alone just might prove to be a fatal mistake. I live in rural Ontario with my real-life hero husband, college-age children, and a young husky with a fetish for rubber boots and remote controls. Although I taught high school math before starting my family, my childhood dream of becoming a writer never strayed far from my thoughts. I dabbled in writing how-to articles and book reviews, but for many years, needlecrafts, painting, and renovating a century-old farmhouse satisfied my creative appetite. Then I discovered the world of inspirational fiction, and my writing took on new direction. On my “graduation day” as a home-educator (i.e. my youngest daughter’s first day of college), I learned that Love Inspired wanted to publish Deep Cover. And so my Undercover Cops series and new career has begun. I’ve traveled this story through the three books, and had my heart in my throat throughout the story. This being the final in the Port Aster Secrets, we do find out who is a good guy and who isn’t, and boy are you going to be surprised. At least I was, I never saw some of the happening coming and who was a good guy and who was bad. I kept hoping from the first page that Kate would finally be reunited with her dad, and make her peace with Tom Parker. He seems to be there and has her back and is caring, but both are keeping secrets from each other. We do get a lot of answers to all of our questions that have been building up, and we dig deeper into all angles of this mysterious plant. There are also some helpful hints about which common plants that God planted near problem plants, like poison ivy, which are remedies, I never knew. I am ready for a next book from Sandra Orchard, if it is anything like this series; I know I will love it. I received this book through the Revell Reads Blogger Program, and was not required to give a positive review. Synopsis: Empty Womb, Empty Tomb is a thought provoking memoir recapping the dramatic events surrounding the premature birth and death of Quiana’s baby boy, Nehemiah Johnson, and the restoring work of the Holy Spirit in the aftermath. March 10, 2014 was undeniably marked as one of the most life altering days of her life as her and her husband delivered their firstborn child at home in the bathroom, only to bury him five days later. Through this tragedy, Quiana learned many truths that allowed her to overcome her trauma and receive one of the most riveting revelations of her life. Empty Womb, Empty Tomb provokes every emotion imaginable as the reader tags along as one woman finds hope and wholeness through venturing to an empty tomb once occupied by Jesus Christ. Quiana E. Johnson is a sought-after Bible teacher and the author of the new book Empty Womb, Empty Tomb, an astounding life-altering memoir for women who desire encouragement, hope, healing, and deliverance from prenatal trauma. Quiana is also a motivational speaker, entrepreneur, worship flag dancer, vision consultant, online radio personality, and CO-Pastor of Transformation Temple International, a new progressive church in the Richmond, VA area. 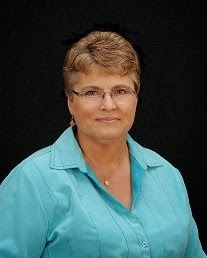 Affectionately known as "Queen", she resides in North Chesterfield, VA with her husband and business partner, Bradley. She is currently finishing her Bachelor's of Science degree in Business Administration and Computer Science at Liberty University. Since the age of 19, Quiana recognized that her predestined assignment is to travel the world teaching women how to overcome their past by having their broken hearts completely mended by the Word of God while becoming engulfed in the purposes of God and representing the Kingdom culture. 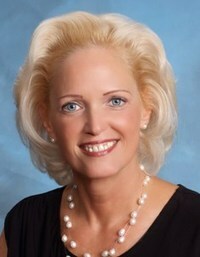 She currently mentors women in achieving the abundant life in the areas of vision, marriage, finances, and self-love.